For most of the 1980s, Marvel’s editorial/creative department had a great corporate culture. With some exceptions, the diverse staff consisted of talented, well-trained and enthusiastic people who enjoyed what they did for a living and had fun together. Many Marvel staffers and freelancers socialized together outside of the office. One result of this culture was a line of highly-successful comicbooks and a portfolio of valuable intellectual properties. At many companies, the tone of the corporate culture is set by the top officers. So, some of the credit for the tone at Marvel during the early/mid ‘80s has to go to then Editor-in Chief Jim Shooter and several of the policies he put into place early in his stint as Marvel’s editorial leader. For reasons I’m not sure anyone really understands, Shooter’s attitude changed dramatically during the mid/late ‘80s and he felt the need to become more dictatorial. As a result, many Marvel staffers and freelance creators left the company, either voluntarily or as a result of direct action by Shooter. As tensions mounted between Shooter and the editorial/creative staff, a dark thundercloud settled in over the Marvel offices. This was not a great corporate culture to operate within and certainly no place to have much fun or produce quality work. 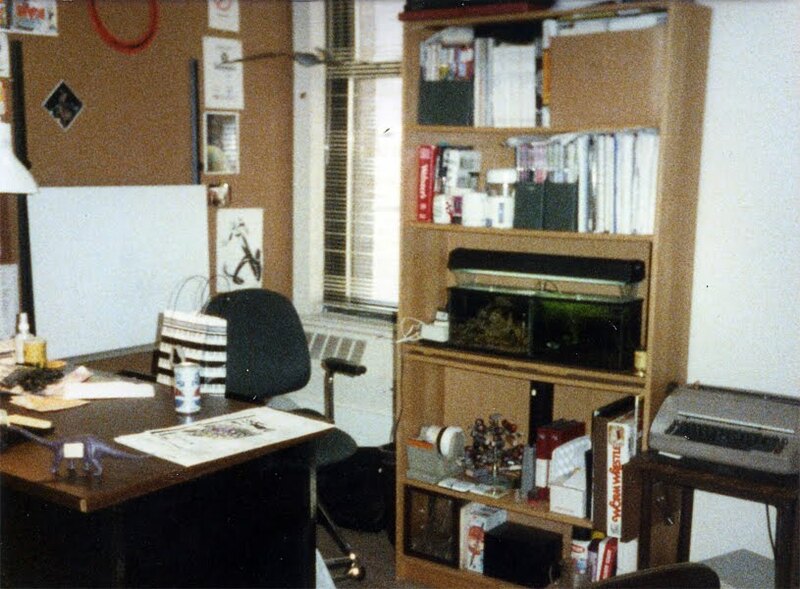 The cloud of tension in the Marvel offices dissipated when Shooter was dismissed by the company brass and Tom DeFalco became the Editor-in-Chief. To help re-establish an atmosphere of fun at Marvel, I came up with what I thought was the ideal practical joke — something that was unusual, funny (I hoped) and harmless. It involved one of my favorite non-comics related activities – fishing. Covered for miles around in pavement, masonry, steel and glass, the area around Marvel’s midtown Manhattan location was not known for its angling opportunities. The only fish around were the tiny residents of a pair of small aquariums in my office. As usual, I arrived at the Marvel offices carrying my art portfolio. Inside was secreted a spinning reel spooled with thin, nearly-invisible monofilament line and a fishing rod that broke down into four small easy to pack sections. I mentioned the practical joke idea to fellow editor Ralph Macchio and he was all for it. His office window looked out on E 27th St. There was a furniture store on the first floor of our building that had large awnings over its display windows. The size and angle of those awnings made it hard for street-level pedestrians to see the building’s 10th floor windows. Ralph and I, however, could clearly see most of the sidewalk. After I put the rod and reel together, Ralph and I looked around his office for possible “lures” with which to entice the pedestrians below to “bite.” We decided the first item to tie onto the monofilament line was a 6” tall action figure of the DC Comics power-hungry and despotic character, Darkseid. The figure had glowing red eyes. Perhaps Ralph felt Darkseid was a good stand-in for Marvel’s previous EIC. Pedestrians strolling along E. 27th St. were surprised to see little Darkseid magically hoping along next to them. Some made a move to grab the figure only to have the DC bad guy elude their grasp, fly up into the air and seemingly disappear. In reality, the editor holding the fishing rod (Ralph and I took turns) would yank Darkseid up and set him on top of the awning, out of sight of the perplexed and generally entertained pedestrians. Everyone on both ends of the fishing line had fun. Darkseid was eventually replaced by a mummified Snickers bar that had been sitting on Ralph’s window sill for years. However, an animated candy bar did not attract as much attention as an elusive diminutive super villain. Finally, Ralph tied on an oversized fake $100 bill. It was a leaf from a giant message pad. Even though the bill was obviously fake, some passers-by tried to grab it as it floated up and down over the sidewalk under Ralph’s window. One lucky person actually grabbed the thing and kept the fake bill. No problem. That message pad mint was thick. Some of those we tempted with action figures, candy bars or oversized currency were Marvel staffers on their way in or out of the building. Word of what we were up to started getting around the office. Marvel’s office manager at the time was a certain Ms. Ehrenreich. To those who didn’t appreciate her sometimes authoritative manner, she was known as “Ehren-3rd-reich.” Ehrenreich thought what Ralph and I were up to was deplorable. She ran to publisher Mike Hobson to complain. I didn’t know Hobson very well then. I just knew was he was my boss’ boss. Hobson came to Ralph’s office to see what was up. At that point, I happened to be the one holding the pole out the window while Ralph was taking a phone call at his desk. Hobson tried hard to sound gruff. “Boys, what the hell are you up to?” he growled while slowly stroking his moustache. Chastised, I quickly reeled in the line and disassembled the pole while Hobson marched off to DeFalco’s office to discuss the matter with my direct superior. I wasn’t sure if Ralph and I were in trouble. Ralph took great pleasure it the fact that he was not the one who had been caught red handed. Much to my relief, I found out later from DeFalco that Hobson started howling with laughter when he told DeFalco about the fishing shenanigans. The team of DeFalco and Hobson helped restore the positive corporate culture Marvel needed to thrive on – and thrive it did for many years to follow. As stated earlier, corporate culture is often set by top management. Marvel’s president at the time was Jim Galton. At one point during DeFalco’s time as EIC, Galton walked down unannounced from his top floor office to ask DeFalco a question. When he peeked into the office and saw DeFalco leaning back, lost in thought, Galton left without disturbing his EIC. Later, when Galton returned, DeFalco was busy dealing with piles of bureaucratic paperwork. Galton had no hesitation about breaking into DeFalco’s work to make his inquiry. Galton explained that DeFalco’s main responsibility was to think and plan. Marvel’s president would much rather interrupt DeFalco’s tedious paperwork than disturb the EIC as he contemplated the editorial department’s strategy and issues. That sort of enlightened attitude from the company’s president helped establish a healthy, and highly-profitable, corporate culture. For many years now, the powers-that-be at Marvel have kept Ralph in a windowless office. I wonder why.